THE Ramu Nickel/Cobalt project in Madang expects better process stability, productivity and Mixed Hydroxide Product (MHP) quality following huge improvement on technical modification efficiency, technical plan and processes achieved last year. 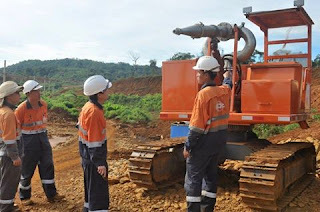 Following strict requirements from MCC-Group due to high operational costs and low world nickel price resulting in huge financial deficit,RamuNiCo management strived to improve the project production and witnessed a series of technical modification and bottlenecking projects that ultimately overcame process constraints and improved production quality. President of RamuNiCo Management (MCC) Ltd, GaoYongxue announced this on Tuesday January 24, during the Company 2017 Annual Work Conference via video conferencing, attended by company employees and management from KBK Mine, Basamuk Refinery, Madang Base and Beijing. “This has settled the conditions for better process stability, productivity and MHP quality in the future,”Mr.Gao said. Mr.Gao said technical breakthrough has been made in hydraulic sluicing in KBK Mine that reduced production costs with a stable nickelsupply over 20 ton per day currently. Modular and precision management skills were applied to nickel grade control in KBKMine forquality slurry supply, assuring for high-load and stableproduction in Basamuk Refinery that has seen ore throughput at Basamuk Refinery exceeding 10,000 ton (dry base) per day, much higher than the design, according to the Company management. “Stable operation of thickeners plus adjustment of crystal seed ratio and nickel precipitation rate have contributed to improved MHP quality with a nickel content over 37% and the moisture rate below 62%,”Mr.Gao said. The Company President said consumption of all raw materials and energy has been decreased while the sulphur melting capacity of the acid system has reached 1,300 ton per day meeting the full day acid demand after more efforts been put into managing process technical indexes. “The permanent change to crystal seed conversion process has effectively bottlenecked problems for the downstream process and the production reached above 100% design capacity towards the end of 2016 will be maintained if the trend continuous,”Mr.Gao said.